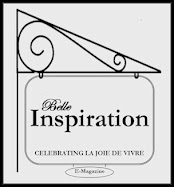 Can you believe that tomorrow we are going to have the long awaited pleasure of looking through the pages of the very first issue of “Belle Inspiration”? I’m lovin’ so much about it already! 1. I LOVE the editor. She is a darling gal! 2. From the preview video below, I love the romantic styling. 3. I love the flip page format. 4. I know I am going to love all of the gorgeous photographs. 5. I love how-to articles and yummy recipes. 6. I love the talented international writers and contributors. 7. I love going inside gorgeous homes and visiting beautiful cities. 8. I love shopping vicariously at the most delicious shops in the most delightful places! 9. I love that I have an article in the first issue!!!! 10. I love that I was invited to contribute to every issue --- Woo-Hoo! 11. I love that this list will be much longer after tomorrow! So, if you haven’t subscribed to “Belle Inspiration”, you are going to miss a wonderful publication that is truly going to have something for everyone. Reserve your subscription here and share in the Joie de Vivre! I know that a lot of you will be checking your e-mail inboxes tomorrow. Enjoy this little sneak preview to get you through the night!!! Join in the celebration at “Bonjour Romance” where a Blogland-wide, launch celebration is taking place right now…complete with a wonderful give away. A Waterman, special edition pen with a pretty band of Swarovski crystals, and a blue case. I am headed over there right now to sign up!!! The winner will be announced on the evening of the 15th. Oh-What a great looking e-publication! And what wonderful news about Dave! We will continue to pray for a complete healing! Wow! Congrats Rhonda! That is just so wonderful. I can't wait to see the beautiful magazine. Wow this is very exciting and from the looks of the video, there will be lots of inspiration. Congratulations on being a contributor. Congratulations, Rhonda. I can see why you are SO excited. I hope the magazine is a true success!! Congratulation on being a contributer. I'm sure you'll do a wonderful job! Isn't Mimi the greatest. I wish her the best with this exciting new publication. Rhonda, How Fabulous I am so thrilled for you!